There are many advantages in learning Java programming language. 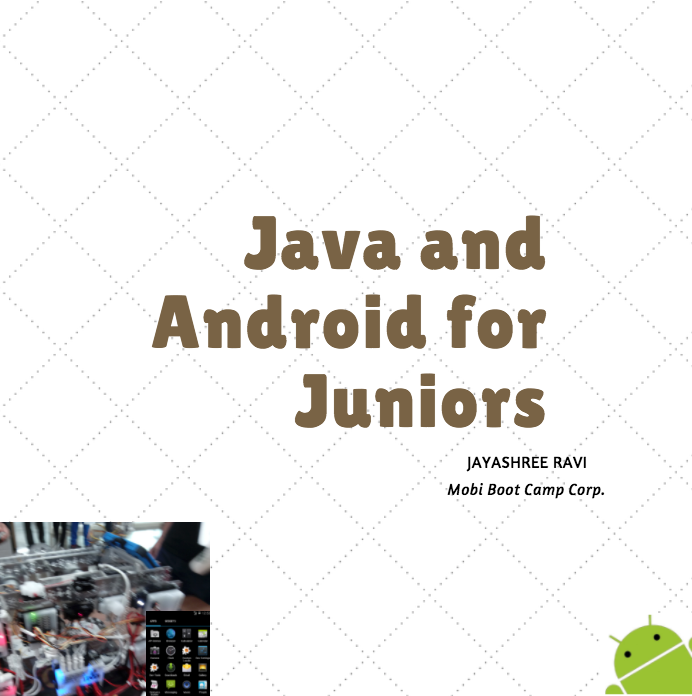 First, Java is a general purpose programming language used to not only write software to run robots but also to build Web application, Android applications etc.. Java proficiency will not only help you in college but also in securing your first job as a Programmer, as multitude of companies use Java to develop their products and platforms today. Android is the most popular mobile platform today. Although Android application can be written in a language other than Java, official language for writing Android applications is Java. This book covers the fundamental concepts of Android programming to help students get started with simple programs. This book is written so that anyone who is taking a debut into Java and Android programming will learn the ropes with easy to understand examples and exercises. This book is recommended for Middle and High schoolers and beyond. Java has come a long way and the latest version is Java 9. In this book we cover the fundamentals of Java which are relevant to almost all versions of Java in the industry today. While this eBook gets you started on Java, you can continue honing your Programming skills with these books.